Mechanical Assistance High Density Compact Mobile Shelving Filing Systems can save up to 50% of your office space with the turn of a handle. Mobile shelving in a nutshell is shelving sitting on carriages on top of tracks that can be moved manually, mechanically or electrically. 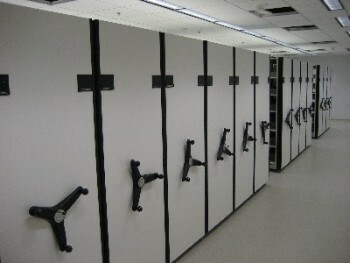 Mechanical Assistance Mobile Shelving systems require only the turn of a handle to manipulate thousands of documents. Only 1 pound of pressure can move thousands of pounds of steel and media. What otherwise would be static shelving spaced out with 36" aisle spaces can now be compacted to allow for more record storage and more office space. Below are links to pages of specific mechanical assistance mobile shelving products. 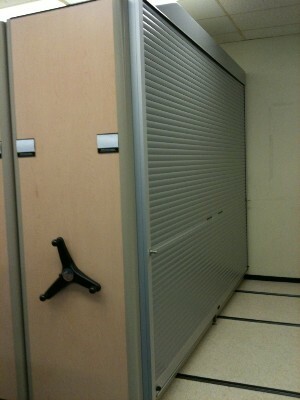 All Mobile Filing systems can be custom designed to meet your filing needs.